Six custom cookies baked from delicious shortbread then printed with your full color design or logo. 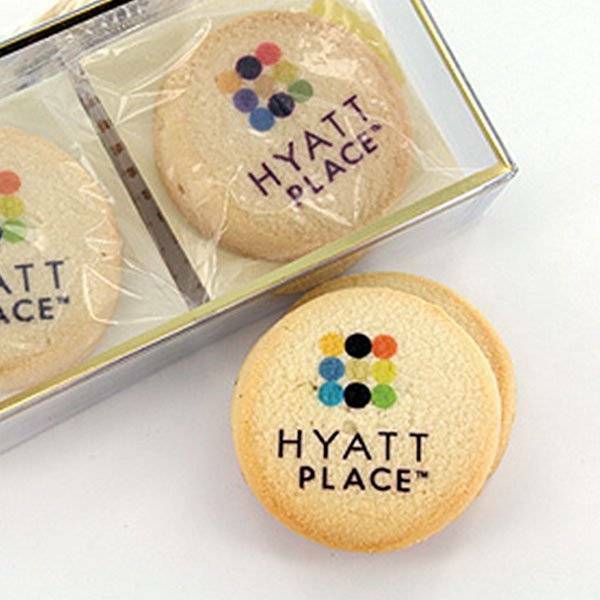 Our buttery shortbread cookies are baked to perfection, then printed with your full color image or logo. The six printed cookies are packaged beautifully in a gold box with a clear top to display your design. These make lovely client appreciation gifts, corporate holiday gifts and gifts for partners or colleagues. They'll never forget the shock and surprise of receiving these delicious unique cookie gifts. To make sure your custom cookies look and taste great, we never use edible paper. Instead, we print directly onto the cookie or onto the icing. Our printing process was developed to maintain the highest quality in taste and texture for your gifts. If you need shipping to multiple locations (drop shipped), coordinate for different delivery days or simultaneous delivery, or have any other special instructions like to include your marketing materials or business card, fill out a Request Estimate form.